With less than a gram of fat per serving, freekeh is a nearly fat-free food, and it’s vegetarian and vegan, though since it’s wheat, it’s not gluten-free. A serving of freekeh (one-fourth cup, raw) contains a healthy 8 grams of protein, less than 130 calories, and 4 grams of fiber. Freekeh also contains plenty of zinc, and it’s also high in iron. The incredibly high fiber content of freekeh is beneficial as keeps you feeling fuller for longer. Whole grains such as freekeh are full of essential nutrients such as selenium, potassium and magnesium. Freekeh makes an excellent source of protein for vegetarian and vegans. Freekeh in a SCI diet – in any diet ! This easy salad is satisfying and full of favour and goodness, it can accompany any meat of fish. Cook freekeh according to packet instructions. I microwave cook mine as I always get perfect results and it only takes 17 mins! Set aside to cool. 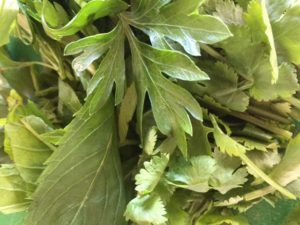 In a large bowl mix coriander, parsley, onion, toasted pumpkin seeds, finely chopped capers, currants and cooled freekah. Mix lemon juice, olive oil, vinegar and salt, to taste, in a jar – shake to combine, stir through the salad with grated rind of lemon. Add toasted pine nuts and almonds. Mix honey, cumin and yogurt together and dollop over the salad. I smacked some pomegranate seeds over the salad to finish – for a crunch, they’re full of antioxidants too! 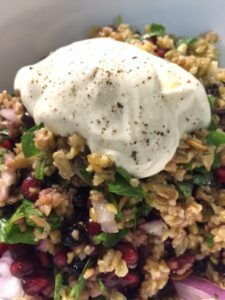 This entry was posted in SCI Diet and tagged Deliciously quick, food and nutrition, Freekeh, Nutrition after SCI, Recipes, Salad by everydaycarer. Bookmark the permalink.